PELABURAN Hartanah Bhd (PHB), which acquired Empire Shopping Gallery in Subang Jaya, Selangor, from Mammoth Empire Holdings Sdn Bhd (MEH) six months ago, has entered into a sale-and-leaseback arrangement with its Amanah Hartanah Bumiputera (AHB) investment fund. PHB has also sold Block H in Empire City Damansara in Petaling Jaya to the fund. The move, however, does not affect the earlier sales agreement entered into between PHB and MEH, which provides the latter with an option to buy back Empire Shopping Gallery in five years. In February, The Edge reported that MEH — a property developer and asset manager — had sold its prized shopping mall to PHB for RM570 million in cash. Under the deal, MEH has a call option to buy back the mall on the fifth anniversary of the sale. It was also given the right of first refusal to buy the mall should PHB decide to dispose of it within the five years. In a Sept 15 announcement, PHB, as the sponsor of AHB fund, said it had entered into an agreement on Aug 8 to sell the beneficial interest in Empire Shopping Gallery and Block H to AmanahRaya Trustees Bhd (ART) as the trustees of the fund. The purchase price of RM550 million will be settled through the issuance of new AHB units. The PHB statement had raised question about the status of the earlier agreement between PHB and MEH pertaining to the mall. PHB group managing director Datuk Kamalul Arifin Othman could not be reached for comment. According to sources, the earlier agreement between the parties is not affected. “PHB only transferred its beneficial interest and still owns the legal interest in the asset,” one source explains. “PHB is merely injecting the asset into the fund. The call option remains intact,” says another source. In addition to the sale of its beneficial interest, PHB also entered into a leaseback agreement for both assets with ART. PHB, in return, will pay an annual rent of RM27.5 million, or RM2.29 million a month, for 10 years beginning Sept 15, 2017. Empire Shopping Gallery is a five-storey mall with a four-storey basement car park, a gross built-up of 600,000 sq ft and a net lettable area (NLA) of 350,000 sq ft. As at February this year, the shopping centre had 216 tenants occupying 98% of the NLA. The mall’s net rental yield is around 6.5% to 7%. Although PHB has purchased the mall, MEH will continue to manage it. 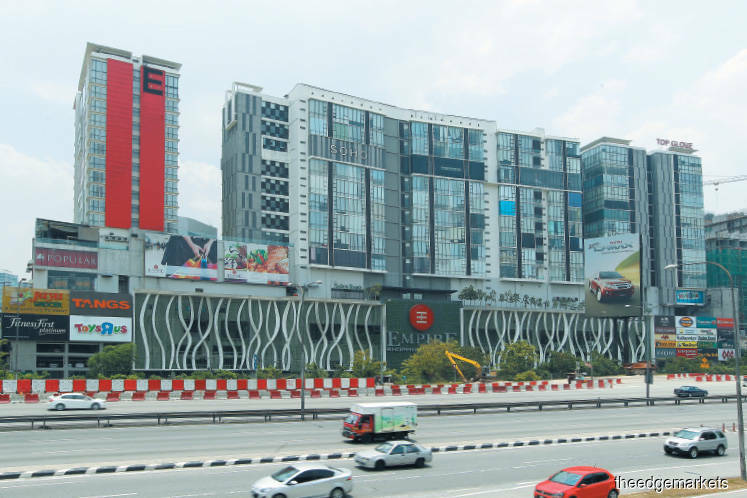 As for Block H of Empire City Damansara, PHB purchased the asset before the building was completed. It is learnt that PHB paid RM150 million for the 18-storey office building with 319 parking bays. An MEH spokesperson was quoted as saying in February that the company’s headquarters will move to Block H on April 17 from Empire Subang. A quick check on the company’s website reveals it has already moved. The Edge understands MEH has taken up four floors in the building, with the remaining floors to be leased to multinational corporations. According to PHB’s website, AHB is a shariah-compliant unit trust fund that invests primarily in commercial properties in prime locations within Malaysia. It was established to provide opportunities to bumiputera investors to participate in owning prime commercial properties as units holders of AHB. AHB’s initial fund size of one billion units had increased to 3.5 billion units by April 26 last year. The AHM units are transacted at a fixed price of RM1 each. The fund’s primary focus is investments in beneficial ownership of real estate that provide a stable income. The minimum entry investment was recently reduced to RM100 from RM500 while the maximum amount has been increased to RM500,000 from RM400,000. Before the injection of Block H and Empire Shopping Gallery into AHB, PHB had announced in August last year that it was selling its beneficial interest in Quill 18 for RM400 million, to be paid via the issuance of new AHB units. ART then leased the asset back to PHB at RM20 million a year for a 10-year term from Aug 1, 2016. Quill 18, located in Cyberjaya, Selangor, comprises two 10-storey office buildings with a 10-storey car park with 2,045 bays. Yet another asset injected by PHB into the fund is One Precinct in Bayan Baru, Penang. One Precinct is a stratified seven-storey office building with a two-storey retail podium and two levels of basement parking. The sale was for RM120 million cash and rent of RM6 million a year for 10 years from March 1, 2016. It is understood that AHB is backed by close to 20 assets that are currently tenanted.